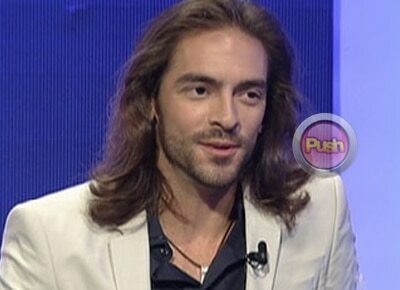 As the star of the upcoming historical film Ignacio de Loyola, Spanish actor Andreas Munoz said he is glad to back in the country to attend the film’s premiere in Manila. "It feels great. It feels really good to be here. It’s my third time to be here and it’s been lovely to be honest. I’ve been eating a lot of food, a lot of Filipino food. My favorite one now is sisig and lechon as well (laughs). In Cebu I’m going to try the real lechon. All you Filipino guys are amazing. You always have a smile on your face and that’s really welcoming. That’s something to be grateful (for) so i love the Philippines. And I know it’s more fun in the Philippines it’s true,” he shared. The film’s special screening at Solaire will be accompanied by a live scoring by the ABS-CBN Philharmonic Orchestra and accompanied by the Ateneo Chamber Singers. Andreas admitted he is thrilled that his family flew in from Spain for the event. "Yeah I brought them here. Being with my mom, my dad, my brother and sister. It’s the best thing I’ve done ever and they’re going to be with me here in the Philippines. It’s the first time in Asia for them so I just want to give them the present of that. We also got a chance to go to Tagaytay to see the volcano and we’ve been to different places to visit the pink sisters so we did a bit of tourism. We’re going to Cebu after the initial premiere and go to the beach and try some lechon,” he revealed. As he plays the life story of St. Ignatius, the 26-year-old actor said one of his favorite scenes was shooting battle scenes in Spain which also served as the backdrop for the most recent season of the popular fantasy series Game of Thrones. “We got really beautiful locations in Spain that’s why obviously for the season six Game of Thrones came to Spain. It feels powerful. Spain is beautiful. We’ve got a lot of corners still to explore and people need to come there to film. For my character it’s been so easy being in my character because I was surrounded by that. I just needed to say my lines. It was really powerful. I’m really proud of the battle scenes and the cave scene. I was really looking forward to the battle scene because I think it’s something that people want to do like a fight with swords so I was really looking forward to it. That’s one of my favorite scenes but it was hard to do because of the heat. It was 42 degrees or something like that in Carmona with all the costume and then the armor and surrounded by fire. So it was hot but I enjoyed it a lot,” he recalled.